Somerset and England batsman Jos Buttler wants to continue behind the stumps beyond the tour of New Zealand. The big-hitting 22-year-old impressed with a quick-fire 54 in Tuesday's T20 defeat by New Zealand in Hamilton. "My keeping is progressing really well and I'm gaining more confidence every game," he told BBC Sport. "I'm just concentrating on this tour at present. When I get home I'll have conversations with the right people - it's a huge part of my game now." 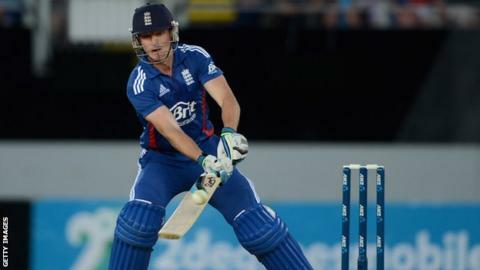 Buttler took over as wicketkeeper after England decided to drop Craig Kieswetter from the T20 side. The Taunton-born batsman feels it is vital to have more than one skill in modern-day cricket. "Everyone needs two strings to their bow; offering something with the gloves is really important," he said. "I'm working hard on it in training and feel like there'll be a constant improvement." When quizzed about his burgeoning reputation as a big hitter in England's middle order, Buttler was keen to praise the influence of his county side, as well as to stress that he will not get carried away. "[Captain] Marcus Trescothick is a big inspiration since I've been coming through the ranks at Somerset and the size of Taunton encourages you to go for big shots," added Buttler. "I take every day as it comes and keep my feet on the ground; it's dangerous to lull yourself into a false sense of security."